Travelling is one thing that you may find common in everybody’s hobby nowadays. In fact, it is a passion for many. People are getting busier and stressed out with each passing day. And traveling is the only thing that can help them to cut off from their busy schedules and get a bit relaxed. As a result, more and more people are in continuous search of online travel businesses that can help them plan their dream holidays. This has led to a massive rise in the competition in the travel business industry. You have to be distinctive to make your online travel business a success. A considerable amount of work goes into setting up your travel business, enhancing the showcase, and getting the desired number of customers. And a few mistakes here and there can ruin your venture even before starting. People can easily plan their routine point-to-point tours or trips with the help of the Internet. What they need is someone to help them plan their trips with varied & complex requirement combinations. You must allow the customers to create and plan their travel packages as per their convenience. Providing regular travel packages will do no good to your online travel business but will instead lead the customers to continue planning their trip on other travel websites. Customer satisfaction is the first & foremost requirement in the travel business. You should be within your customer’s reach at any point of time. Yielding prompt support to your customer’s queries & complaints can save many of your customers from moving on to other travel portals. Try giving quick solutions and clearly mentioning all the instructions can help your business from getting bad reviews on Google & other social media platforms. It’s very simple: “People buy what they look at and like”. So, it becomes necessary to have an attractive and engaging user interface. Customers should be easily able to traverse through your travel portal and get all the things they want. Your travel portal needs to have a simple yet classy design with an appealing call to actions, appropriate sorting filters and easy payment & checkout options. All these will help the customers to take up your proposal at the most opportune time. There are numerous travel websites on the Internet. Following the same strategies like them won’t do any good to your business. It’s tough to beat them & move forward. At this point, you need to have a Unique Selling Proposition (USP). USP is the thing that differentiates you from the rest of the crowd. This means that you need to deliver something that none of the businesses from your niche does. For example, you can transform your business message to sell expert advice & personalized services rather than some deals, offers & discounts. Promotions or marketing is the best way of reaching out to your target audience. Most of the travelers start searching online or on the social media platforms before planning their trip. Lacking marketing and promotions will make you lose some of your potential customers. You can hire an Internet marketing company to do this task for you. People don’t like to spend much time browsing all the options. They prefer websites that provide them with relevant suggestions as per their needs and interests. In this scenario, personalization can help you. Personalization allows you to learn about each customer so that you can suggest relevant solutions aimed at their needs and interests like What is their budget? What hotel brand do they prefer? Are they flexible with their dates? etc. By doing just a bit more than your competitors, you are sure to stand ahead of all the other online travel businesses and guarantee that you have a continuous flow of travelers for quite a long time to come. 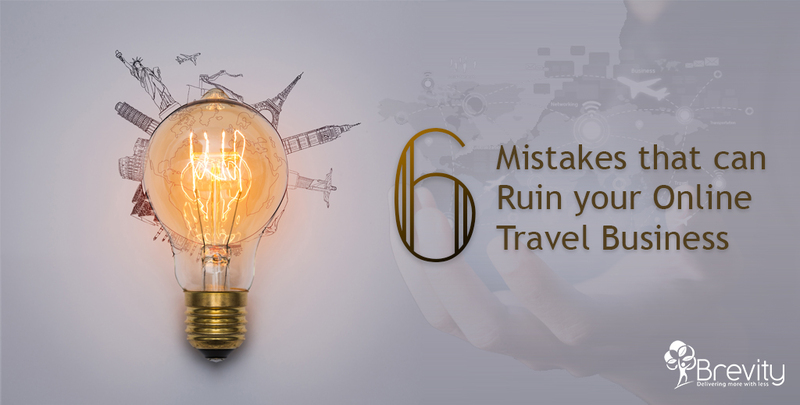 By evading these 6 mistakes, you are on your way to establishing an independent travel business. If you are looking to start your own travel business then check out our travel portal development solutions. We can help you to get your own online travel portal. Get your quote now!